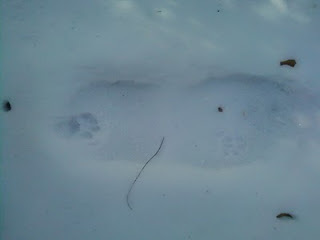 Yesterday, my sister's post was titled, "Footprints in the Snow". So, I decided to copy keep with her theme with today's title. Is it a raccoon? A possum? A skunk? Any guesses? I don't know what it is but it's precious!! I am not good at guessing. Nice picture though!! Are there many raccoons in the area? My guess would be possum. Certainly hope it's not a skunk! I'm going with raccoon, too. The stride looks too long for a possum, too short for a squirrel. Hi Mary, my guess would be a possum..let us know if you see any! Thanks for stopping by my blog on Saturday, I have entered you for the giveaway! My parents have 5 grandsons, no granddaughters and this baby will be great granddaughter #2! we visited some friends last week for the championship game and saw deer and rabbit tracks in the snow leading up to their front door and on the porch. something about seeing those is just magical.